Liverpool get a 89th minute equaliser as both teams remain unbeaten. Chelsea have now only won two of their past nine home Premier League games against Liverpool. That late goal was good news for the 5 who got this spot-on, and the 5 who had the outcome. Lewis Grabban scored twice and missed a penalty as Forest rescued a draw, to ensure both sides have lost just once in 10 league matches this season. Just the 2 (basher2010 and Pinault_Noir) had this spot-on, and the 8 who predicted a 1-1 got the outcome. Barnsley came from behind to get a comfortable win. Well done to Blue4U2 for being the only one to get this spot-on, though 9 did have the outcome. Wycombe are still to win at home, as Southend almost throw away a three goal lead. Nobody had this spot-on, and there were 4 who got the outcome. Crawley have scored in every home game since they lost to the U's on Boxing Day. Again nobody got this spot-on, but 11 did have the outcome. Matt Taylor was sent off for a cynical 95th minute tackle that helped ensure Swindon avoided defeat. Another game without a 3 pointer, though 8 did get the outcome. These were the hardest set of fixtures to predict so far this season, and the results backed this up, with only the late kick-off at Chelsea giving any sort of respectability to the week. That late Liverpool goal helped to push up the total of 3 pointers for the week to 8, though if it wasn't for the stoppage time goals from Barnsley and Crawley, there would have been more. So a low scoring week where nobody had more than one 3 pointer, and we have a five-way tie for the honour of being the weeks top scorer. Those being RSCOSWORTH, gerry_us, burnsieespana and TheHappyGooner, who all had the Chelsea 1-1 spot-on, and Blue4U2 with his good Barnsley 3-1 pick, and with two outcomes they all got a good 5 points. A special mention for Tropical_Us for being the only one to have four outcomes. In the Premier A difficult set of fixtures had RSCOSWORTH going 1-1 all games, and that proved to be a good decision, as he increases his lead to a decent 7 points. 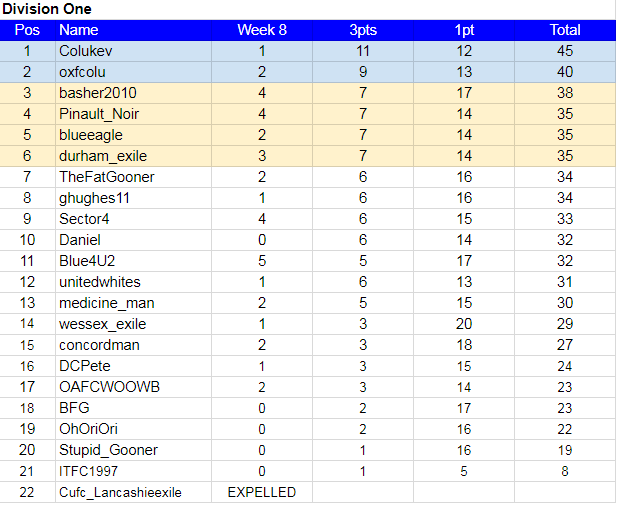 Up another place into second is gerry_us, with his points being gained in a more conventional way. Not such a good week for gsy163, but he holds onto the final Charity Shield spot. The good week for burnsieespana moved him up a couple of places, and took TheHappyGooner out of the relegation spots. In Division One Just the one outcome for Colukev, but he still has a healthy lead, as oxfcolu can only reduce the deficit by a point. That good Blackburn 2-2 pick moves basher2010 closer to the automatic spots, and moves Pinault_Noir up five places into fourth. The other member to benefit from having the Chelsea 1-1 spot-on was Sector4, and he moves up a couple of places, and well in sight of the play-offs. After his recent decline Blue4U2 will be pleased to move up three places after his good week. A no show for the third week running means ITFC1997 is just one week from being the second member to be expelled from this league. Week 9 Fixtures It is off to the city for this weeks games. "City" week Mick.? Can I do the "Wednesday" week?